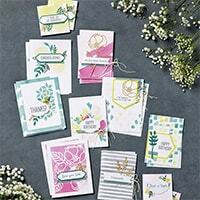 Pictures just don’t do justice to these gorgeous cards that are part of the SOFT SAYINGS CARD KIT in the Annual Catalog. This is an all-Inclusive card kit, which means it comes with all the supplies to make 20 cards, the stamp set, and an ink pad. The only other thing you need is adhesive! This is the perfect kit not only for yourself, but to give as a gift! 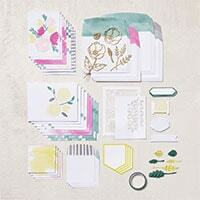 This card kit makes 20 cards–2 each of 10 different designs. There is also a REFILL KIT available. It’s just $21 for all the supplies to make 20 more cards! This kit and the refill kit is a great value. Recently my sister Jodi from Wisconsin came to visit for a week. She has never really gotten into stamping, but you can’t visit me without spending time creating in the stamp room. So I gave her one of these kits and she had a blast. Like I said earlier, this kit would make a perfect gift. Jodi loved it, and as a brand new stamper she was able to easily make all 20 cards! I am hoping maybe I got her hooked on stamping! We will see. Maybe I will have to send her a different kit for her next birthday.